In ‘The Nature of Light’, Nicholas Hagger reunifies knowledge in terms of the One Fire or Light. Mysticism, religion, cosmology, nature studies, the workings of the universe, physics, astronomy, metaphysics, science are all shown to be inspired by the same experienceable reality. In ‘What is Universalism?’ Nicholas Hagger defines his philosophy of Universalism, which focuses on an energy that permeates all things/the universe and the soul/the universal being of all mankind, with great universality. Just as universalist religion and history concern every human being in mankind, so Universalist philosophy focuses on the power that links every human being with the Being of the universe. It therefore penetrates into mysticism, cosmology and science, and focuses on a new interactive view of man and the universe that has practical applications. In ‘Reductionism, Holism and Universalism’, Nicholas Hagger considers reductionism, a form of scientific materialism, and distinguishes holism (which seeks a materialistic whole) and Universalism which explores the universal, metaphysical Whole and its universal energy which flows into the universal being of all organisms. He brings about Bergson’s “much-desired union of science and metaphysics” and effects a Metaphysical Revolution. Appendix 1 offers a television treatment of Nicholas Hagger’s view of the rise and fall of civilizations and of the Fire in six religions; and traces the progress of ten religions in relation to their civilizations. Appendix 2 states Nicholas Hagger’s “Form from Movement Theory” which accounts for the origin and creation of the universe. Appendix 3 challenges the Darwinist, materialist view of the brain’s neurons and proposes transmissive consciousness. Universalism returns philosophy to its pre-Socratic roots in the thinking of Heracleitus and Parmenides (c.500BC) and follows the empirical metaphysical tradition of Plato, Leibniz and Kant, who attempted to create models of reality in terms of which every element of human experience can be interpreted. This tradition was kept alive in the early 20th century by Bergson (the philosopher of Vitalism), Whitehead, Husserl, T.E.Hulme and others before being curtailed by the Vienna Circle whose philosophers arbitrarily disqualified metaphysics in favour of linguistic analysis and logical positivism. They were not interested in revealing the Reality behind the universe. 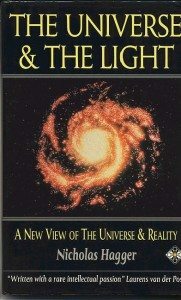 The Universe and the Light defines a new philosophy. It retrieves the Vitalist tradition in philosophy by explaining the nature of the metaphysical Fire or Light and the origin of the Universe. It challenges the sceptical and materialist scientific philosophy of Stephen Hawking and presents Reality in terms of an infinite, self-aware, moving first principle which explains everything. The book’s unitive vision linked the individual to the greater Whole and was hailed as an important antidote to the bleak reductionism of modern philosophical thought. In our time, materialists (cosmologists such as Hawking, neo-Darwinian biologists such as Dawkins and deconstructionist philosophers such as Derrida) have excluded the spiritual and divine as mysticism. Their view reduces man to an accidental and futile collection of atoms, cells and neurons. A bleak reductionism holds sway in the universities and primacy in physics, cosmology, biology, physiology, psychology and philosophy. Nicholas Hagger’s revolutionary approach liberates these disciplines and unites them with mysticism, metaphysics, religion and history. Advocating (with Bergson) a new metaphysical science, he achieves a marriage between physics and metaphysics that restores man’s uniqueness and purpose and undoes the reduction of man. Nicholas Hagger has launched a Metaphysical Revolution in all the sciences and philosophy. Here is a challenge to 150 years of reductionist materialism in many disciplines and to 90 years of analytic and linguistic philosophy. When the universe is seen in terms of the Light, a true Theory of Everything becomes possible, a metaphysical holistic approach which includes the influx of divine wisdom, understanding, love and healing. Here is a revolutionary view of man, the universe and everything from a new philosopher who has replaced Existentialism with Universalism, a new philosophy which asserts that the universal energy of the Light manifests into the universe and guides man’s soul or universal being with great universality, an experience which is central to all religions. There are many who specialise, but few who can cross boundaries and relate disciplines with such authority as Nicholas Hagger. Not since Coleridge and T.S. Eliot has a reflective writer who is also a poet probed the underlying cultural unity of our civilization with breadth and depth, to reveal the hidden but manifesting reality within the universe which some call God. An outstanding and unexpected marriage between cosmology and its metaphysical counterpart. Very impressive. This attempt to bring together physics and the philosophical vision of the cosmos in a coherent whole is interesting and worthwhile. David Bohm, Professor of Theoretical Physics at Birkbeck College, London and author of Wholeness and the Implicate Order. I am an unashamed reductionalist and as such I regard holism as mysticism. Stephen Hawking, Lucasian Professor of Mathematics at Cambridge University and author of A Brief History of Time. Holistic concepts have a profound role in modern mathematics and physics, and need not be mystical; Hagger’s broad sweep over the holistic scene is not so constrained by scientific desiderata. Roger Penrose, Rouse-Ball Professor of Mathematics at Oxford University and author of The Emperor’s New Mind. Sums up the rise and dominance of reductivism to date admirably. Drawn together like this, the story is startling: it will surely look so at some future time. Challenging, serious and timely. Mary Midgley, Philosopher and author of Science as Salvation, A Modern Myth and its Meaning. It is nearly 100 years since William James first warned against the reductionism which he saw increasing in the scientific and philosophic spirit of his day, the ‘but only’ element as he labelled it. Even he would have been dismayed at the extent of the empire the element has established in all the disciplines he valued, and how much he would have supported all those who value the quality and range of a truly comprehensive modern awareness as Nicholas Hagger does in all he has written with a rare intellectual passion in all his work since The Fire and the Stones.